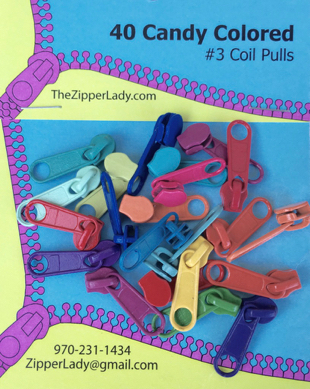 This is a selection of 40 pulls in bright colors for #3 coil zipper tape. Use up all your bits of zipper tape by adding extra pulls. These fit craft zippers, finished zippers for pouches and bags. Pulls are just under 1" long.